If you received the unimaginable news that your child had cancer, would you know where to turn? Support exists right here in the Santa Clarita Valley with the Michael Hoefflin Foundation for Childrens Cancer. 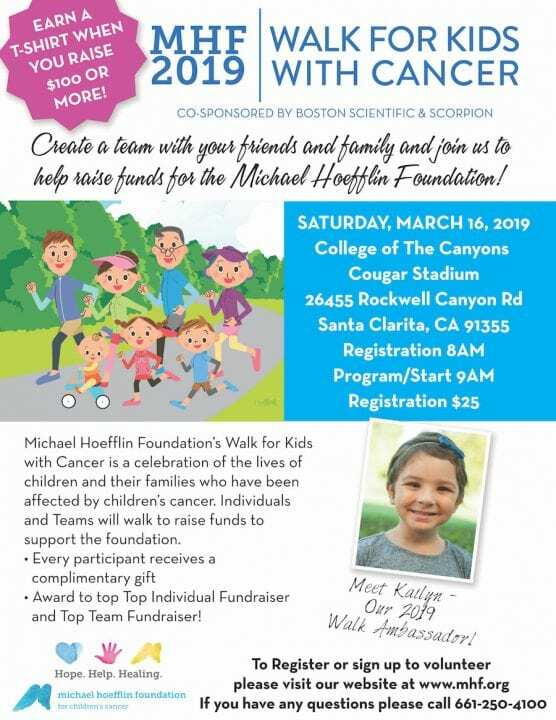 To help support the foundation and families battling pediatric cancer, the Michael Hoefflin Foundation will host the 9 th Annual Walk for Kids with Cancer, on Saturday, March 16, at College of the Canyons Cougar Stadium. For more information or to make a donation, go to www.mhf.org. Co-presenting sponsors of the Walk are Boston Scientific and Scorpion. The annual fundraiser offers hope to those who may feel there is none. All funds raised from the walk go directly to support the Michael Hoefflin Foundation and its services. Last year’s event raised $85,000 this year, the Foundation hopes to raise $100,000. Throughout the year, the Foundation helps families in many ways, including providing gas and grocery assistance, support group meetings, and family outings — aid crucial to families dealing with the emotional and unexpected financial burden of cancer. The Michael Hoefflin Foundation for children’s cancer is a public non-profit 501(c) (3) foundation serving children and families touched by pediatric cancer in the Santa Clarita and surrounding valleys. For more information please contact us at (661) 250-4100 or go to www.MHF.org.